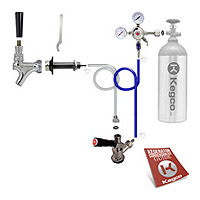 This Standard Kegerator Conversion Kit from Kegco gives any do-it-yourself beer lover the tools they need to turn their refrigerator or freezer into a high quality draft beer dispenser. Thanks to a commercial grade dual gauge regulator that allows you to monitor both CO2 pressure in your keg and CO2 volume in your tank, and a lever handle keg coupler that is more durable and long-lasting than a wing handle coupler, you can confidently build your own kegerator with all of the exciting features of a professional dispense system. Kegco is with you every step of the way, with detailed instructions included in every kit and knowledgeable product specialists available at 1-800-710-9939 to answer all of your questions. Comments: This kit came with everything I needed (except the tank as you stated clearly), It had simple to follow directions and I put the system together in about an hour! Nice kit. Easy to install. Comments: Used for a Fridge Keg dispenser. Comments: Great kit and had everything needed to complete my kegerator! Instructions were easy to follow as well. Comments: Everything is there. Exactly what I ordered. Comments: Quick and easy assembly, great instructions, no more cans to deal with! Comments: I looked and looked for a conversion kit, finally I settled with this one, I could not have made a better decision. Good instructions, good products, easy assembly. Comments: I purchased this kit because im what i like to call myself a "minibrewer" and was getting sick of bottling it each time. it really couldnt be any more simple to set up and start drinking beer Asap. Comments: put it together in about an hour.great directions. works real good. should have done this years ago. Comments: I used this kit on an old fridge. A cinch to hook up and took little time (30-45 mins total). Like a kid on christmas when I got it in the mail. This is an incredible deal, local shops ask almost 2x as much. Just be careful were you place the shank if you ever want to swap handles. I mounted mine a little too high so I cant get one too tall or I can't open the freezer to get a frosty mug. Well I got my tapper right on time, drilled a 1 1/4 inch hole on the (SIDE) of refrig. Its a new stainless model the wifey wanted to save. I can now just plug the hole and she will never know its been a tapper. I would reccommend Beverage Factory always. DUDE I just tapped it with 1/2 barrel of BUD, I have dramk 8 mugs, I am numb all over. Dude by one of these SOBs, DON"T DRIVE THOUGH, I have a friend doing a year for 2nd DUI. Thanks Beveragr Factory, you are great! I may invite the neighbor gal over tonight for a bud on tap, wifey is gone fot the weekend. Holy crap I am ripped...Bye for now I better eat somehting. Comments: If you love to pound beer and watch teams like Ohio State loose to the Gators and have a spare fridge than you are going to love this kit. Installation took approximately 10 minutes and within 15 minutes I was enjoying my beer. I keep my PSI for Bud Light around 13 LBS and so far its working out great. Great Kit... one thing though! Comments: Everything showed up promptly with great instructions and installation was easy. One thing though- the Co2 tanks come empty! I wondered about that.. but as the description says "everything you will need to successfully convert your refrigerator into a draft beer dispenser". Well.... almost everything. Comments: This product has been fantastic!!! I upgraded to a Perlick faucet couldn't be happier!!! Actually converted a side-by-side refrigerator to hold a 1/2 barrel! It also works great for homebrew too! thanks again B.F. Comments: I bought this kit to convert our extra garage fridge into a kegerator because a few of my favorite Washington beers, Manny's Pale Ale (Georgetown Brewing Company) and Mac n Jack's African Amber don't come in bottles. I had to find an old type twin-probe keg coupler as I didn't see one available here (for the Mac n Jack's). If I have one regret it's that I didn't go with the deluxe kit, since the drip tray is turning out to be a requirement - I ordered one and it showed up in about 3 days. After doing much comparison shopping, Beverage factory has the best prices on kegerator kits by FAR :) Big thumbs up to Beverage Factory!! Comments: I bought this and assembled it faster than i had imagined. It works great, wish i would have discovered this sooner! Comments: I am stunned you Buckeyes figured it out! Comments: Great kit and so simple to use even a RichRod lover up north can use it. Comments: This is great. Super easy to install. Very easy instructions. Very prompt delivery. I was drinking beer in less than 30 minutes. I would highly recommend buying this for a secondary frig or the main one. It is a must have!!! Comments: I have had a spare fridge in my garage for years now and my wife finally let me buy a conversion kit to turn it into a kegerator. All it took to install was one hole through the front of the fridge. I'm a pretty handy guy, so it was a piece of cake for me, but if you're not, Beverage Factory gave all the instructions with the kit and it's only one hole! All of the parts seem like really good quality (nothing plastic) and it ended up being a whole lot cheaper than buying a kegerator. If you have a spare fridge, you NEED to convert it to a kegerator! Comments: This kit just has made my life a whole lot easier. I was looking at keg machines for a while and could not figure out which one to get. My friend told me about this site and these conversion kits. I bought one and love it and now I'm back to get one for my brother. This is going to be the best birth day gift I have ever given him or anyone for that matter. So I am a happy customer and buyer thanks guys!!! Comments: This kit is a dream! I actually used it with my RV for tailgate parties. We have the tap mounted on the side of the rv and the keg on ice on the inside. I got the wrap around faucet lock to keep it under wraps when it's time to head into the stadium. i'm thinking about adding 1 or 2 more taps since it works so well! P.S. REAL football fans hate the buckeyes!